Nursery bed for pediatric use. Useful in daily activities for baby care from hygiene to dressing. 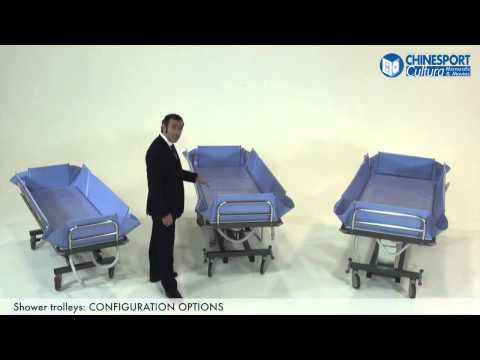 A comprehensive range of configurable shower and transfer trolleys for children, adults and bariatric patients, suitable for use both in care facilities and at home. Sturdy frame provides rustproof, hygienic and easy to clean commode chairs, suitable for person with more or less severe disabilities. They are easily accessible, comfortable and space-saving. Sturdy frame provides rustproof, hygienic and easy to clean shower chairs. These chairs are used exclusively for assistance during showering or bathing. They have a front cut-out for personal cleaning. Sturdy frame provides rustproof, hygienic and easy to clean commode an shower chairs. Are used exclusively for assistance during showering or bathing or for transfer of persons inside buildings. Turning bath seats that allows getting in and out, and lowering the patient from the upper edge of the tub down to the bottom. Assortments of aids for the disabled and sick, hospital supplies and accessories for bathrooms. A comprehensive range of shower trolley, comfortable chairs and showers, bathtubs and shower enclosures for disabled, flanked by the lifters for the bathtub and bathing aids. Solutions and facilitations for the personal hygiene of the elderly or disabled patients. Update, printed in October 2017; 20 pages; English. International Edition, printed in October 2016; Pages 473 - 502; English. 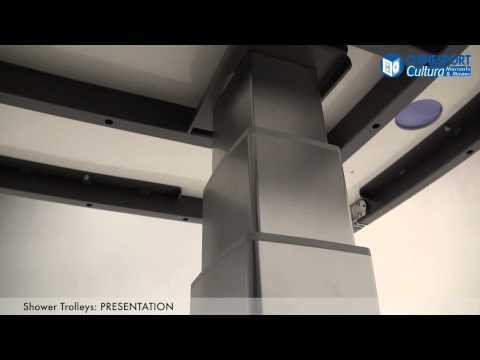 An overview on the main features of Chinesport shower trolleys program. A complete range of shower trolleys for paediatric use, adults and bariatric use. 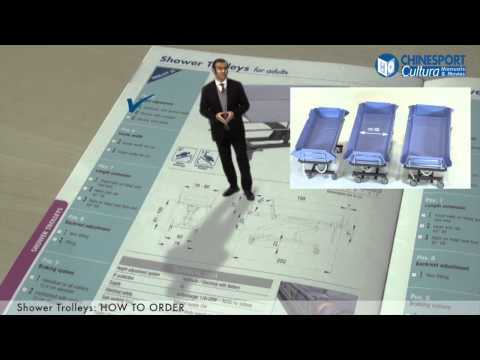 How to order a Chinesport configurable shower trolley.